Steak is often the centerpiece of meals in Argentina and Uruguay, and it’s delicious without much dressing up. So whoever thought to top it with a fried egg, mozzarella, and ham? Pure genius. While I’ve heard claims that the story behind the chivito‘s origins is urban legend, I tend to buy it because…well, it’s just not that remarkable. As it goes, back in the 60’s an Argentine woman vacationing in Punta del Este went to a restaurant and asked for chivito (little goat) like they had back home in Córdoba. Basically, she was craving a baby goat sandwich. Since the chef didn’t have any goat meat, he created this sandwich instead and dubbed it chivito. It’s now recognized as a national dish in Uruguay, and is also popular in parts of Argentina where it’s sometimes called lomito. It’s usually served on a crusty roll with a thin slice of churrasco, fried or hard-boiled egg, ham, mayo, cheese, and tomato. 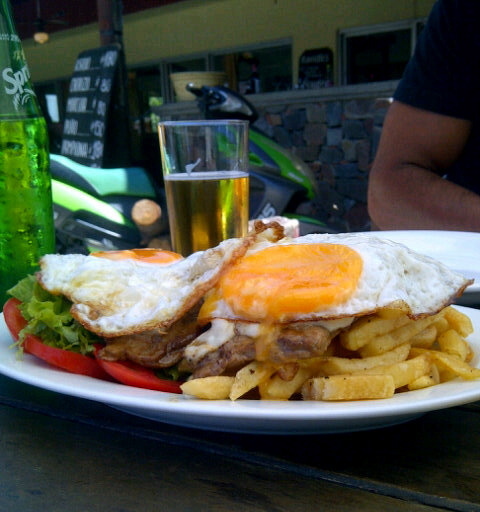 Chivito al plato is basically just served without the bread, usually over papas fritas. Sometimes it’s served with a side of Russian salad (as in the photo above), which I’d never heard of before but is a little heavy on the mayonnaise for my taste. While I love the sandwich version, particularly of the street vendor variety, I find them really messy to eat so I prefer to go al plato and dig in with a fork and knife. Not that eating one of these is possible without making a mess. They tend to be on the gargantuan side. If you’re not in the neighborhood, try making one at home. A recent article in the New York Times puts chivito on par with iconic sandwiches like the Reuben and Philly cheesesteak, and offers a breakdown of recommendations for preparing them. El chivito es puramente uruguayo! El mejor!